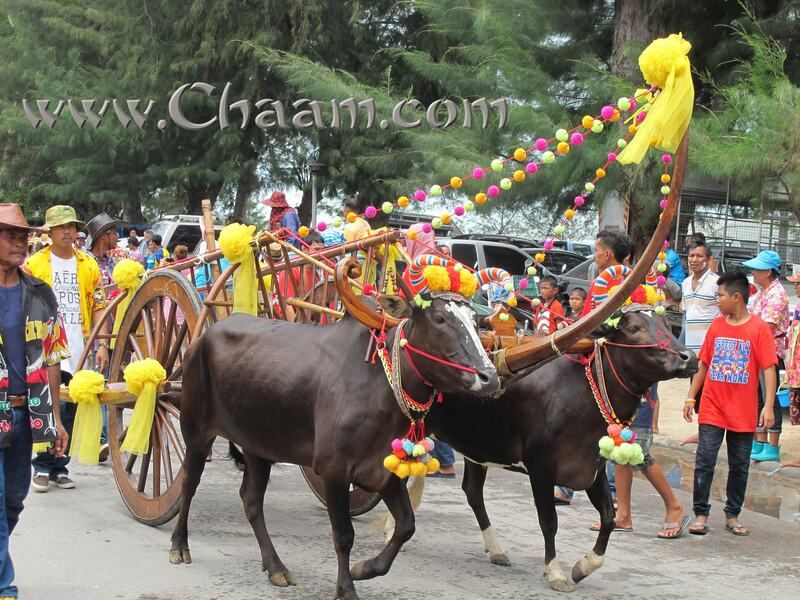 Every year the traditional street parade takes place in the beach road of Cha-Am, where all the shops, hotels, bars, farmers and other commercial present themselfes colourful. 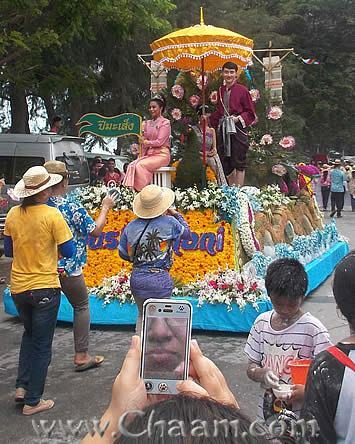 Some luxury hotels fitted the carnival float so beautiful with many flowers. 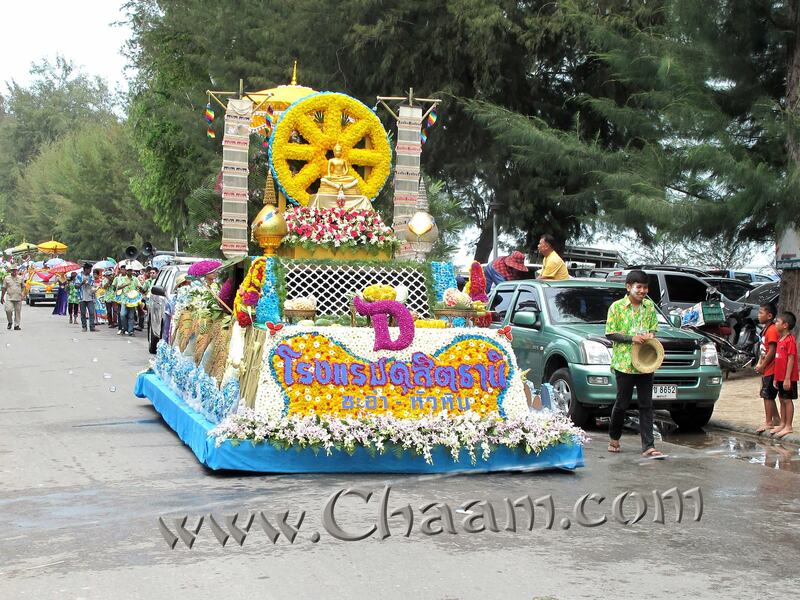 It took many days working for many people to prepare a car to a carnival float. 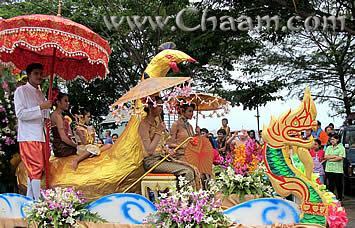 Many of the Thais were dressed with traditional clothes, most made out of expensive Thai silk. Also the five star hotel Dusit Thani, which is close to Hua Hin was beautiful represented. 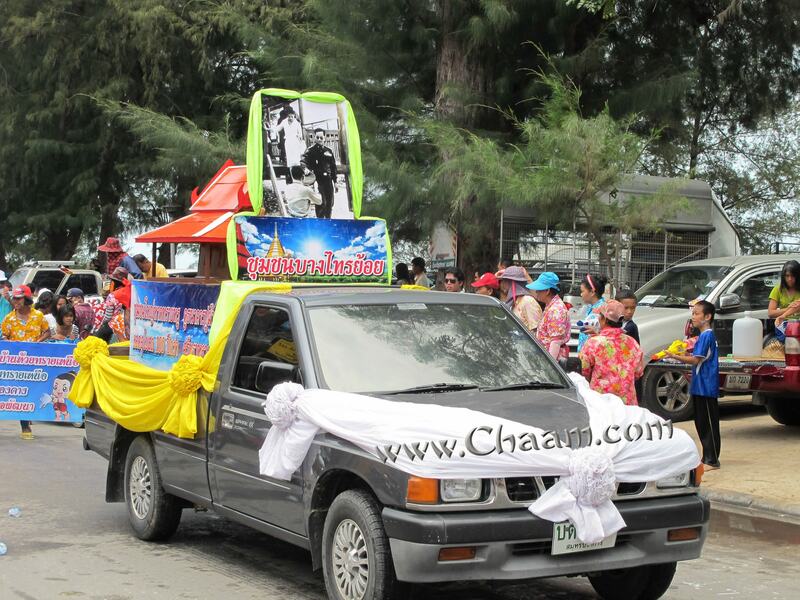 Some provinces in the destrict of Cha-Am made their cars beutiful and decorate them with a picture of the King Rama IX, to honour his majesty Bhumibol Adulyadej. 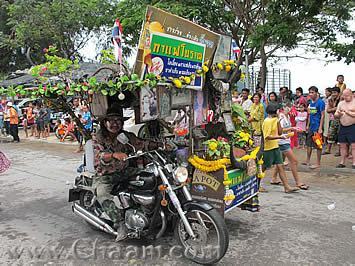 In the big city of Hua Hin is no carnival procession, this only takes place in Cha-Am. 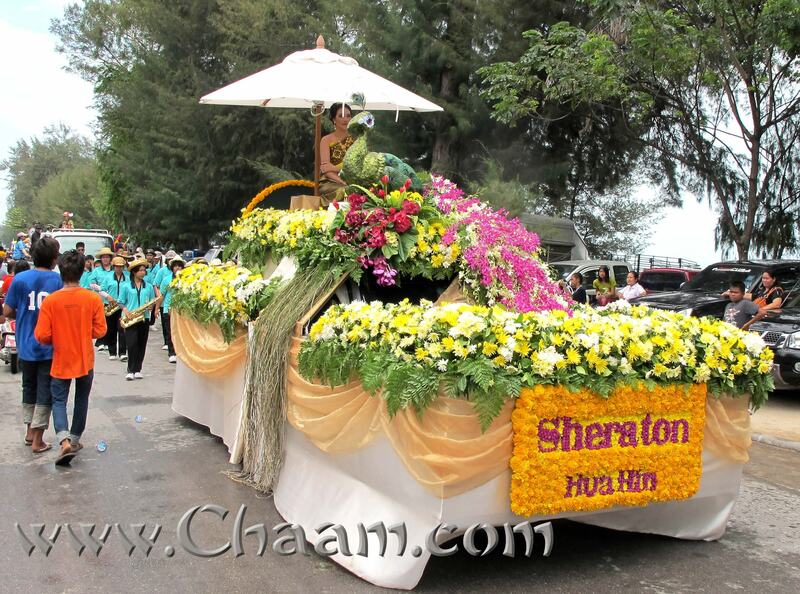 So also luxury hotels like the Sheraton Hua Hin want to have their own float to represent their hotel in Cha-Am. 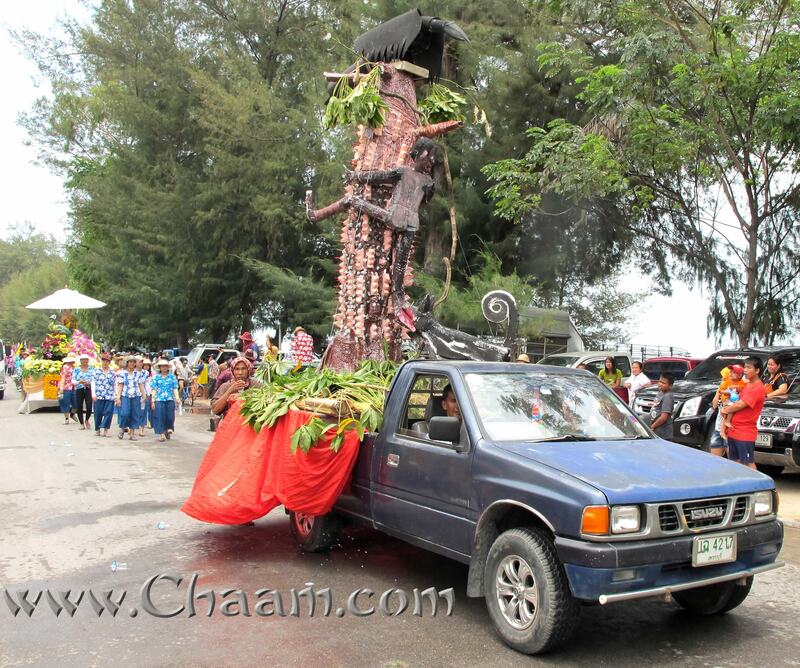 But the most interesting vehicles were driven by local heroes of Cha-Am, like the famous Coffee-Man or Farmers. The groomed and neat water buffalos represent the hard working farming people, around Cha-Am. 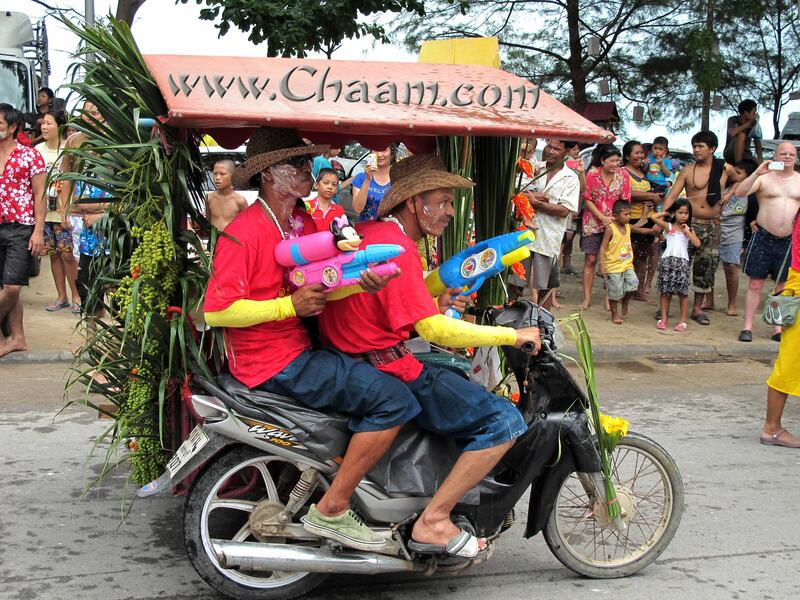 Withouth them Cha-Am would never be so nice and rich like now. Other animals, everybody know from Cha-Am, are the dogs. At the car on the right, a dog is hunting a man up on a tree and bites his leg. One car had problems with the motor. 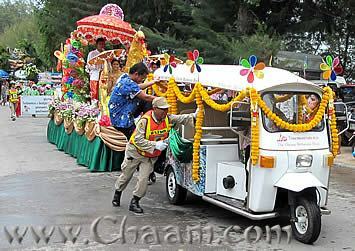 But it was no problem for the ceremony, because many people come to help, pushing the car. And this float was very beautiful! 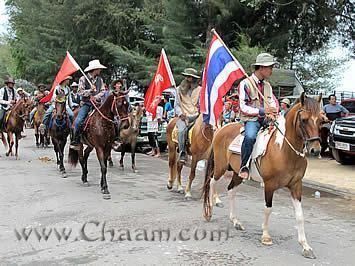 Here are the horses from Cha-Am prodly presented by their owners. 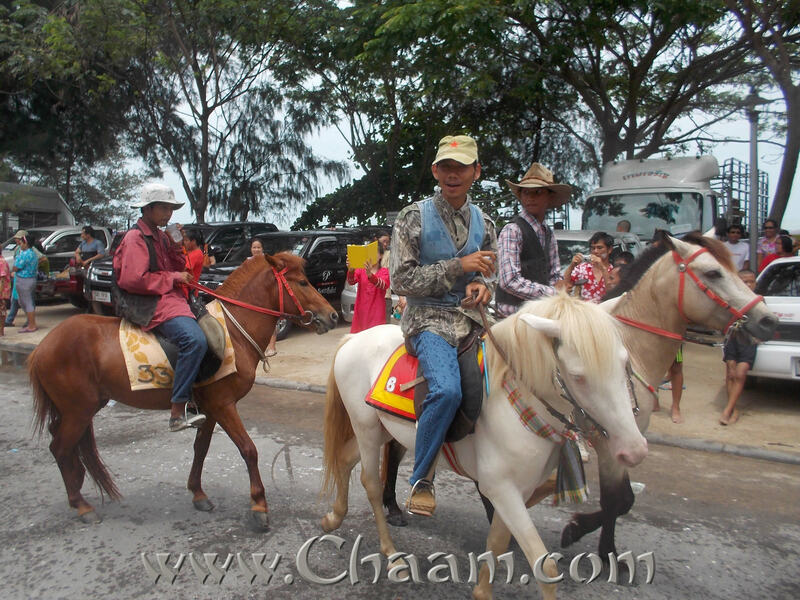 Horse riding is one of the things, you must do at Cha-Am beach, especially for children it is a lot of fun! This small boy has one of the most important jobs to do: He keeps the street clean from the horse dung. Thank you for this, my friend, if YOU not work, many people would have problems! 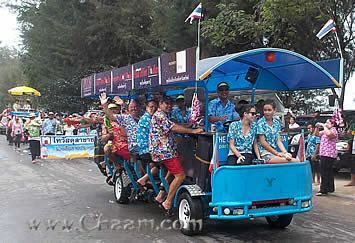 Here the well known OKay Supermarket from the Narathip road is representing themselfs on a selfmade party bike. 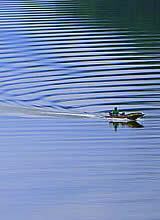 What looks like fun is also hard work, because every man on the chairs must pedal that the vehicle can move. But for safety reasons the owner Paul has always a lot of beer onboard, that nobody can die of thirst. Paul has - by the way - the best netherland cheese in Cha-Am! 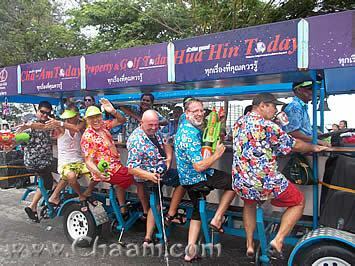 The party Bike rolls again!